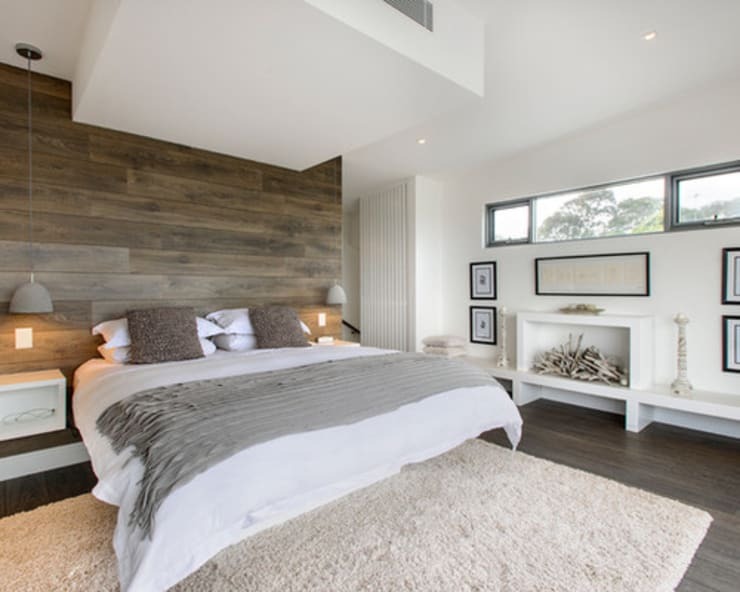 Today on homify we bring you another stunning, proudly South African project, but this time, with a bit of a twist. Instead of exploring an architectural endeavour, we will here look at an interior design undertaking. This just goes to show how diverse the professionals in our country are and the high-quality design available in all fields. The home under our scrutiny today is referred to as the Waterfall Estate, and you'll soon see the parallels between the home's interior and that soothing natural water feature. Each space seems to flow effortlessly into the next, and a golden thread of continuity runs through the entire home without a sense of monotony or one room looking like the next. We begin our tour of this home at an unusual starting point: the veranda. It is such a spectacular spot, however, that we just couldn't resist jumping right in. The colours and hues of this area are so evocative and gentle, you can only let yourself be soothed by the atmosphere as you slowly melt into the scene. This living space is very particular, since it is entirely opened up to the outdoors. 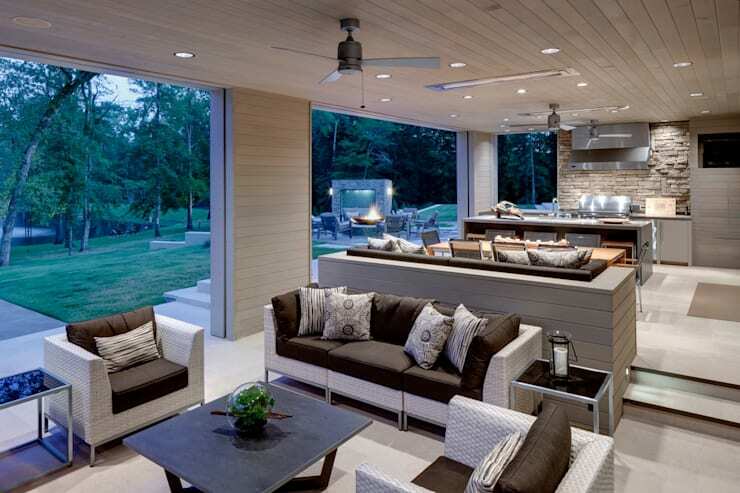 This allows for a seamless integration between the indoor and outdoor spaces of the home, and a communication with the natural environment that is found wanting in most other modern homes. This is a theme which is perpetuated by the natural materials used in this area. The gentle colour of the wooden details does well in creating a relaxing environment, and the laid-back furniture provides the perfect balance between comfort and sophistication. Now let's move on closer to the culinary heart of the home. Of course, we had to include this area in our investigation, as it always gives you an indication of a true character of a place. This kitchen-dining area is definitely a winner. Here we can see a cool combination of cold and warm elements, with strong natural overtones and gentler hues to compliment the look. In the kitchen space itself, the main material used is wood, which is used for all of the cabinets and cupboards. The counter tops resonate with the dining room table, which is made of a beautiful and elegant granite. 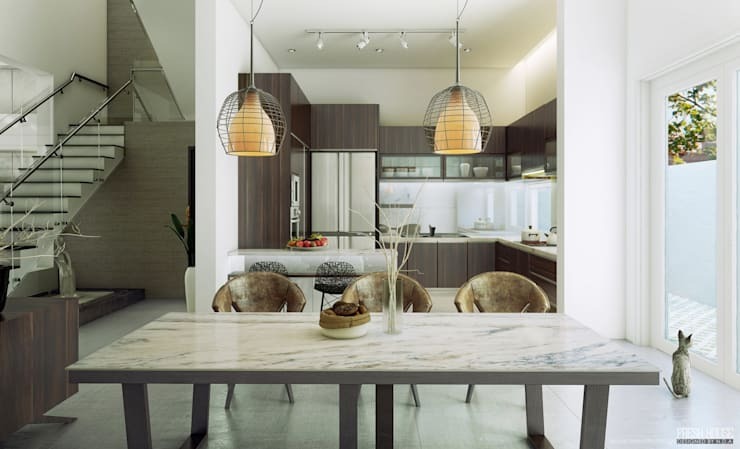 The dining space is dotted with natural items, such as the leather-covered chairs. The lamps hanging over this space brings in a dash of warmer colour, and creates and interesting effect with the wire casings. Here we have a special living area indeed. The living rooms in contemporary homes tend to lean to sterile, spacious environments, which are minimal and unburdened with excessive decorative elements. This style is, of course, in line with contemporary trends and aesthetically pleasing, but it can leave rooms feeling cold and unwelcoming. This is definitely not the case in the home we are looking at today, however. Here, the atmosphere is that of warmth, sophistication, and comfort. It is a feeling that is tangible at the very moment you see it. This is achieved by the luxurious materials used for the upholstery and carpet, the wooden detail n the wall and ceiling, and the gentle hues of white and beige employed throughout the space. Now, let's move on to the master bedroom of the home. Here, we see the same themes that had been present in the previous spaces—natural warmth, warm colours, and gentle decoration. Although these elements of the larger interior are continued here in the bedroom, this space as an unprecedented intimacy to it, which is just what you want for a master bedroom! 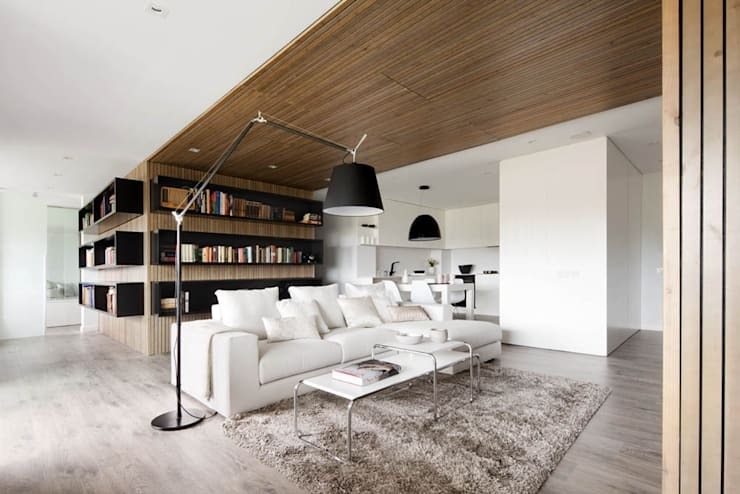 The space is largely white with wooden accents, which expand the sense of size in the room. This is then complimented by various neutral textiles to soften the space to a great degree. The texture of these different textiles also brings some variety and depth to the room. Wouldn't you agree that this is a supremely calming room?! Are you inspired by this wonderful bedroom? Well then, why not take a look at how you can create: Your own dream bedroom? We finish off our tour with another type of bedroom—that of an adolescent. The success of this space just goes to show how well the interior designers did in creating the perfect family home with space tailored to each room's function and need. This neutral space is the perfect stylish backdrop for its inhabitant to customise it according to his or her particular tastes. It is also an excellent example of practical space usage and effective storage. What more could a teenager need? Which of this home's rooms did you like the most?